These clip-on air fresheners simply attach to any car vent and continuously release refreshing fragrance scents over the life of the product. The flow of the fragrance can be adjusted by the control dial on the front of the air freshener. 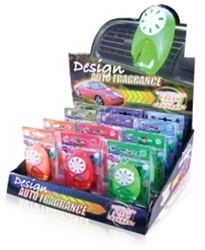 Each display box contains assorted designer scents, appropriate for all of your customers who are looking for a functional air freshener while adding a cool touch of "cute" to the interior of their car. Our Clip On Air Fresheners are packaged 12 blister packed units per display.